Need to add a brass tank outlet to your rainwater tank, or join several tanks? Select your required diameter below, send us a quote request with your delivery location, and we will get back to you. Please note: you must select your required diameter in order to add to your quote cart. Add a brass tank outlet to your rainwater tank, or connect several water tanks together. 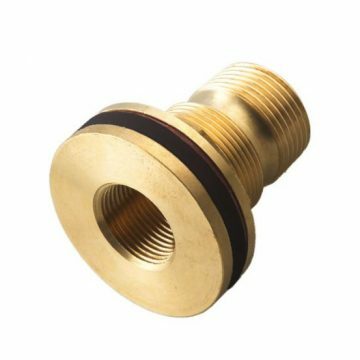 These brass tank outlets are Australian Standard Compliant and Watermark accredited. Their left hand threaded lock nut ensures the fitting remains tight when connecting right hand threaded valves and pipework. We recommend you engage the services of a plumber to install your brass outlets. Be the first to review “Brass Tank Outlet” Click here to cancel reply.